Dinu's Yarden: August Updates - Colours! After the July rains, how fast plants have grown! The last I posted was 12 days ago. Now let us see how the Yarden looks like. Tomatoes are yielding nicely. A small harvest. But there is one wax tomato posing in this basket. Tomato plant is obscured by the Morning Glory from this angle taken from the offset of the house. The bicycle wheel is ready to take the vine which is supposed to grow up the wall. I have relocated Antigonon tubers, but they do not seem to be showing signs of recovery. Some other flowering vine will be planted if Antigonon fails. Profuse flowering of the pink MG. Never expected this would do so vigorously. The Holmskioldia is in full bloom, a treat to the Sunbirds and Tailorbirds. The jaquemontia when it grows up just about where the orange spray bottle is hung, it will add some blue. The yellow now. First time I'm growing Gaillardia. My local friend Ramaswamy gave his extra seedlings. I gave him Evening Primrose and Butterfly Weed. That morning glory again, closer view. Yet again, posing for my own camera. Ten seconds to click the button and stand like that. See garden colours. Purple Thunbergia, reddish tomatoes, Holmskioldia reds, Pinks, Gaillardia yelow and different shades of Picotee Cosmos. It will take some time for the Gladioli to bloom. The plants are obscured by tomatoes from this angle..... the camera was on the rain barrel. 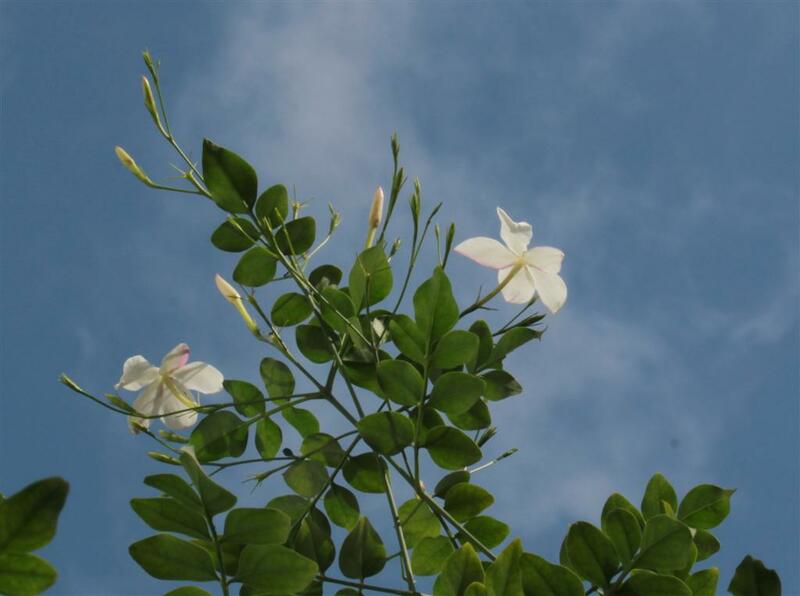 Star Jasmines are in bloom at this time. It is beside our front door. We call it 'jaaji' in Kannada. For the arch at the pond-side bench, I made space for Clitoria double purple. I had to move the stone bench a little further. It had been placed there in a hurry some months ago. Slowly things are happening. On the left of that arch, I have this. The Jaquemontia will climb up the arch and the butterfly weed should form a bush. This is the Clitoria. The pot on the bench you saw has it. I will maintain this short by pruning. See the old grinding stones. I have 6 of them. This is the bed left of the bench. I have to see how well I will be able to control the Evening Primrose. Growing fast! Texas Star Hibiscus died. In the pot is a set of Tuber Rose extra bulbils. Others are in the Gladioli bed. Thithonia seedlings are coming up in the pots. Will be moved away. Next to Gaillardia, I have planted Zinnias. Right bottom you see Nicotiana mutabilis - 2 out of four plants seen. I throw away my clay pots only when they cannot hold any plant. If the bottom half is good, I continue to use them by carefully chipping off the portions where the pots break. So, shallow pots are enough for smaller bulbs of Rain Lilies. Here are the pink variety. With a hope of getting Senecio confusus [Mexican Flamevine] I set about two nurseries. One was closed. Proceeded farther to another only to be disappointed. 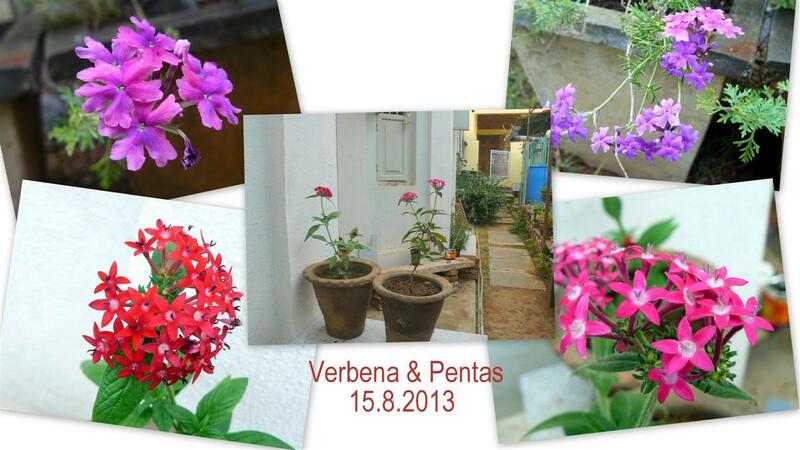 But to make the child in me not to cry for that, I bought Pentas and Verbana, both supposed to attract butterflies. But where is the space in the Yarden? I decided to plant the Pentas in two pots. Verbena waits for its ground until Sunday next. My favs: The clitoria . . . and the grinding stones!